NextInterview: Glenn Richards talks about Augie March’s new album Bootikins and their upcoming tour. In-depth fan review: Veruca Salt live in Melbourne. Back in the mid ‘90’s, Veruca Salt was one of the hottest acts. Two headstrong young women, Louise Post and Nina Gordon, with Gordon’s brother Jim Shapiro on drums and Steve Lack on bass, created mayhem on our charts with their album American Thighs, and mesmerised audiences worldwide with their shows. In 1997, the onslaught continued with their follow up Eight Arms To Hold You. From it came a collection of songs that included Volcano Girls, Shutterbug and Benjamin that would become fan favourites. But something strange happen almost soon after their 1997 Australian tour, founding members Nina Gordon, Jim Shapiro and Steve Lack left the band. Louise Post was left to pick up the pieces, reinventing the band along with a number of revolving members such as Nicole Florentino and Kellii Scott. Under Post the band failed to recapture the glory days, but the ardent Veruca Salt music enthusiast, those fans who had every album and collectable imaginable, never forgot the impact VS had on their youth and lives in general. But before I continue and get down to the business as to why I am here, I’d like to briefly let my Millennial and Generation Z friends in on a secret. Despite our obsession with instant gratification through popular music today, alternative rock is something that still exists, and breathes fire, and we only need to stoke the flames for it to come alive. This is where Veruca Salt’s greatest strength lies in its unwavering loyalty of its fan base. When the original line-up reunited in 2013, off the back of an email shared between Nina and Louise, who else do you think was first to come to the party? Their fans, of course! We never disappeared, we held on to hope, like a child believes in Santa Claus, that one day they might return again. So now that Veruca Salt are back, and in truth kept coming back sporadically over two decades, it is because they know they are loved by Australian fans. Importantly, for diehard fans that love it seems has always been reciprocated by the band too. Interestingly, I once read Louise Post likened the return of Veruca Salt (since 2013) to a wound that was healed, maybe even a void sealed and mended between the band and fans alike. This was always going to be a very difficult review to write. You see I am a diehard Veruca Salt fan, since as early as 1994, when they released the inescapable American Thighs, with its big alternative rock hits like Seether, Number One Blind and All Hail Me. And so it’s fair to say I have for the most part excused myself from being an objective observer here. Along for the ride, I have also asked a handful of new friends I met last week for their personal thoughts, upon seeing Veruca Salt’s Melbourne show last Friday 9th March at 170 Russell. If you will indulge me a little first with some fandom, I promise my story is related somewhat to their Melbourne show. Last Thursday, the day before their show and sometime after Nina and Louise got lost in the National Gallery of Victoria, a small group of fanboys and fangirls gathered outside of Triple M studios, as contest winners to see a live acoustic rendition of Seether played by Nina and Louise. Following their interview with Melbourne’s very own Jane Kennedy and Mick Molloy, and the radio performance itself, we were ushered into a room to meet the frontwomen of Veruca Salt. It’s fair to say, some of us were absolutely nervous, but that was immediately downplayed by the approachable and refreshing candor of Nina and Louise. In short we were all dumbstruck (almost) but I nonetheless managed to sneak in a cheeky question related to their setlist for Friday night. I asked whether the setlist was set in stone. Fair question, right? I hoped and pleaded my case to hear Laughing In The Sugar Bowl and added I understood it was often difficult to change a wider setlist that had been rehearsed for a tour. Undeterred Nina apologised and said that they would not be playing Sugar Bowl and in hindsight now I realised why, because we were all in for a number of surprises. The night, of course, didn’t begin with Poetry Kit or the infamous Shutterbug. Twenty-three-year-long Veruca Salt fan Lisa Anne recalls, “The performance began with Louise and Nina harmonising Wolf, and it was an all round rocking gig. I got to hear (also later) songs from Ghost Notes live at a show for the first time. They appeared happy to be there and touched by the fans adoration.” In fact, the subdue opening of Wolf with the Nina and Louise teasing the crowd with playful chords was met by cheers I had never heard before. Soon after Jim and Steve joined in on the song and the stage was set, like Lisa said for “an all round rocking gig”. Between a night filled with thrashing guitars and harmonies, there was also plenty of goodwill stories and banter. Firstly, there was Nina’s tongue in cheek comment about whether they should play the Sound Of The Ball!!??!! For those lucky fans who managed to pick up a copy of the special edition vinyl of Eight Arms To Hold You at the merchandise table, a misprint on the back of the vinyl is hilariously pointed out with a personalised squiggle. Louise also told us two stories, one about the first song they ever played together back in Chicago called Empty Bottle, and the other related to Nina and Louise’s reconciliation called Eyes On You. What’s more, there were tears and smeared mascara, a cat You Tube video (I think) and Louise’s alternative rendition of what the Game of Thrones theme really sounds like, a scene of “killing horses, killing doggies, killing kids!! !” That said, Nina and Louise certainly know how to work a room! Importantly, as we sang along and waited for our cue to jump in on the big moments, especially “You monkey you left me” for Shutterbug and “The Seether’s Louise!” for Volcano Girls, I often felt bad for two of the bands unsung heroes – Jim Shapiro and Steve Lack. It is somewhat unfortunate that they often appear to take a back seat to both Nina and Louise. Jim as Nina’s older brother has arguably had a lifetime of being shown up by his strong-willed sister? I know, my younger sister does it to me all the time! But you know what? Jim’s a cool guy. For the most part I believe his sense of humour and incredible abilities as the band’s drummer are second to none. His timing is usually impeccable, equally his deft touch and heavy hitting tempo. And what about Steve? Well Steve’s importance to the band is without question. But he too, is also often overlooked by many fans. Aren’t all bass players anyway? But Steve’s greatest strength, as he stands up front on his mark, is as always his ability to provide Nina and Louise oodles of space and time, and he did that with measured control during the show last Friday. In fact, what is enjoyable about Steve’s playing is, how sometimes his bass is really obvious like on Shutterbug, pulsating and throbbing, truly making the song, and at other times simply just providing the right amount of atmospheric sounds. This fan review could honestly ramble on and on. But I think its fair we conclude it here. But before I go I have just one small complaint. Just saying that almost feels sacrosanct for a Veruca Salt fan. I can honestly hear the gasps as I write. So what is my complaint? It is minor and simply a technical sound issue that can easily be remedied. Sometimes Nina and Louise vocals are lost underneath the heavy sounds of guitars. For a fan, this might not be an issue, we all know the lyrics, but to a new fan the enjoyment of slightly muffled vocals can be perplexing. In spite of this the quartet that we all affectionately know as Veruca Salt have every reason to be proud of their Melbourne show. Importantly, they will by the end of next week leave fans with a flood of wonderful new memories, as they finally wrap up their Australian tour. Finally, I’d like to leave super fan Joshua Nash with almost the final word. He arguably best sums up last Friday night for all of us. Joshua says, “(The) show serves as further proof that Veruca Salt are one of the most beautiful bands to grace the recording studio and stage. The ‘Fab Four’ of the alt-rock universe.” I guess coming back in the future makes it all that more easier when you are loved and hopefully with a new album! Special thanks to Hayden Crimmins, Leigh May, Ryan Dmr, Lisa Anne, Ben Langskaill, Joshua Nash and all my friends at Veruca Salt’s fan Facebook group page for their insight and contribution to this fan review. 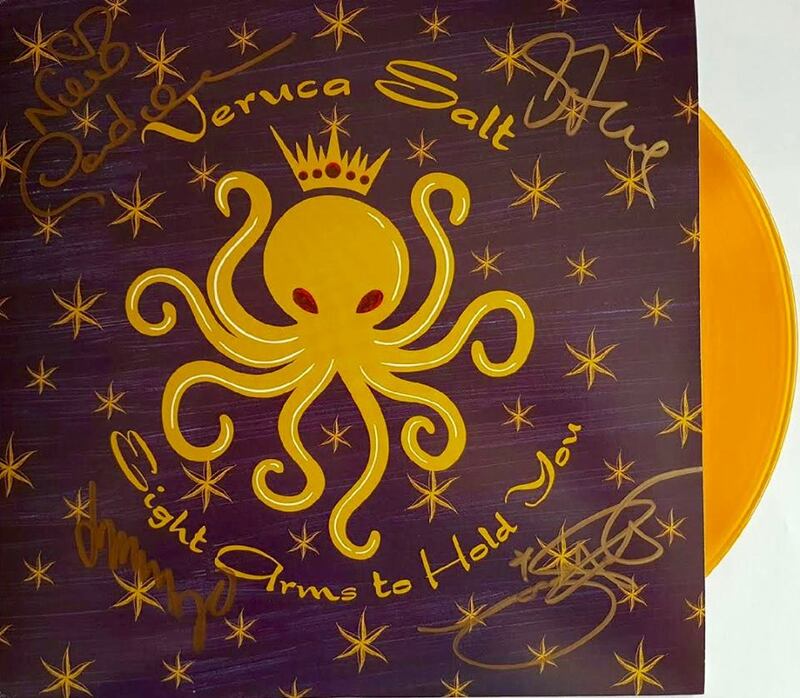 For more information on Veruca Salt, you can visit their website. You can also connect with Veruca Salt via their Facebook page or tweeter feed @verucasalt. Follow them on Instagram. Watch them on You Tube. Photo credits: The header image of Nina Gordon and Louise Post is courtesy of Hayden Crimmins. It cannot be used without his expressed permission. The second image of Veruca Salt was photographed by Robert Horvat. You lucky Gen-Xer 🙂 Having said that, my favorite Veruca Salt song is ‘So Weird’ – and that’s on the set-list. But glad you went and had a great show. Interview with Canadian Singer Songwriter Terra Lightfoot.